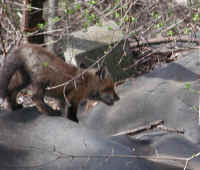 (Red Fox (Vulpes vulpes) - 01) In late April, we spotted five baby red foxes playing outside their home; this is a photo of one of them. We has preciously seen momma's foot prints in the snows of February and March. 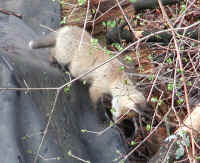 Her home had been previously occupied by a family of gray fox (See: Our Neighbors: The Foxes). 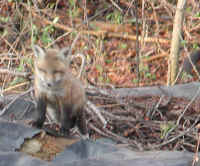 (Red Fox (Vulpes vulpes) - 02) This is another of the red fox babies on the roof of the woodpile home. 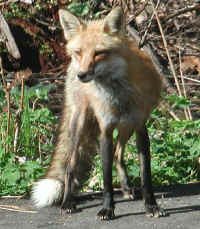 The female red fox conceives during late December to early January, and have only one family a year. 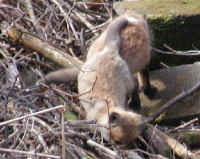 The gestation period is only about 7-1/2 weeks, and usually between 3-5 blind babies (kits) are born in late February to the beginning of March. 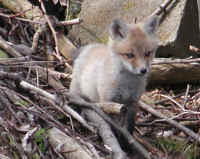 (Red Fox (Vulpes vulpes) - 03) This is another photo of this red fox baby. 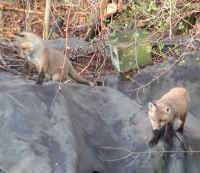 They move very quickly and it is difficult to get a photo of them without some part of their body being blurred. 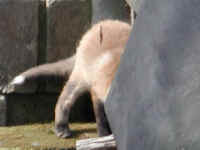 The babies eyes open after about 1-1/2 weeks and they remain in their home for another three to four weeks until they are partially weaned; they are fully weaned about 2 months after birth. 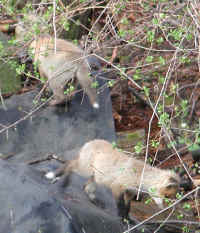 Within another couple of weeks after first emerging from their home, they are romping and playing all around their home, which is when we first saw them. 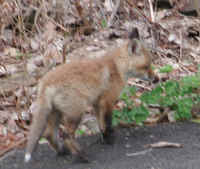 In this photo we can also see the red fox characteristic reddish upper body coloring with black legs and feet and a white tipped tail. 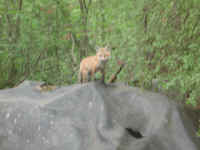 (Red Fox (Vulpes vulpes) - 04) This is a photo of another one of the babies getting ready to jump off of their home. 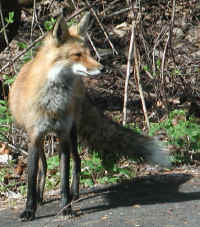 People are often concerned about red foxes having rabies. Unscrupulous people who wish to kill them often spread panic about the seriousness of the problem to try to justify their killing, so we believe it's important to learn the facts. 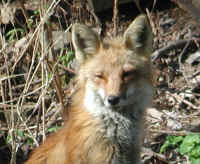 An official New York State publication states in part, "Most red foxes actually die from rabies too quickly to spread the disease to other animals or humans. 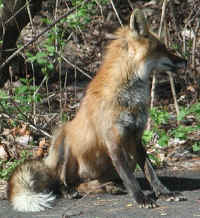 Nevertheless, rabies always should be considered when one encounters a tame or sick looking red fox. Leave the animals alone." 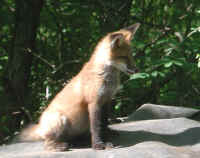 (Red Fox (Vulpes vulpes) - 05) This baby red fox is sitting on top of his or her family home. 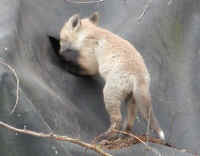 In this photo, we can also observe the white fur on the under side of the chin and throat. 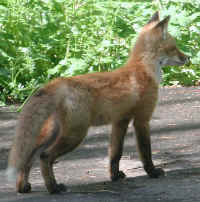 When fully grown, a red fox will weigh between 7 and 14 pounds, or about the same weight of a domestic cat. 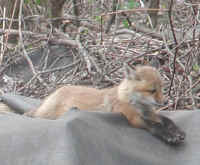 (Red Fox (Vulpes vulpes) - 06) This baby red fox is sitting on some of the firewood of their home, where a section of the covering has been ripped open. 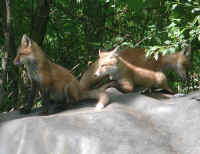 Red foxes usually prefer to live on or around the pastures or meadows of farm lands, but occasionally they will live in the woods as this family is doing. 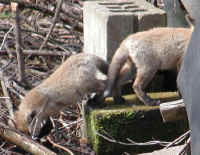 (Red Fox (Vulpes vulpes) - 07) These two babies are playing on the concrete blocks piled at the entrance of their wood pile home. 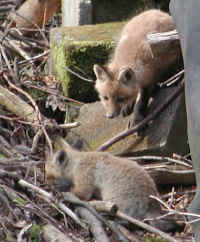 Red fox babies are often cared for by both their fathers and mothers, and also occasionally by an older sibling of the previous year. The first solid food that the babies eat are partially digested food in the adult's stomach, that is regurgitated for them. 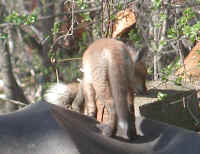 This doesn't sound very appetizing for us humans, but fox babies seem to enjoy it. (Red Fox (Vulpes vulpes) - 07a) There is something very precious about the inquisitive look on the face of this baby red fox. How could anyone doubt that God created them with souls and spirits just like He did us! We have such enjoyment in watching them live their lives as God intended, that we cannot understand how anyone would want to kill them. 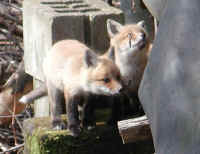 (Red Fox (Vulpes vulpes) - 08) Now both of these baby red foxes are looking intently at different things. The one on the right seems to have a piece of grape vine stuck in his or her teeth. 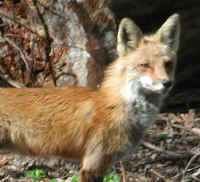 Some literature refer to the red fox as being a carnivore, but other literature, we believe more correctly, refer to the red fox as being an omnivores, because a substantial portion of the warm weather diet includes grasses, other vegetable matter, and fruit. (Red Fox (Vulpes vulpes) - 09) "Well, it's time to relax for a few moments until something else attracts my interest." 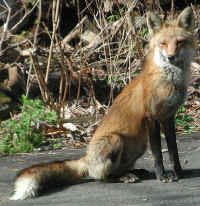 The red fox is not strictly territorial, and they may occasionally share their home with another family and will adopt the orphans if the parents die. 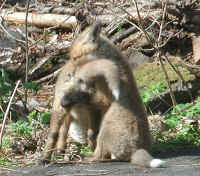 We believe that this is the reason that we have seen reports of red foxes having as many as 13 or 14 babies. 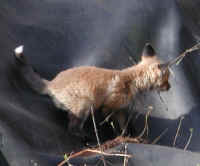 (Red Fox (Vulpes vulpes) - 10) But after a rest period of only a minute or two, this baby red fox found something else of interest. 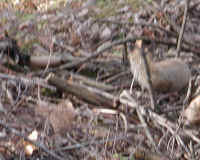 Usually, red foxes live in burrows in the ground, which is quite often an abandoned ground hog burrow. They seldom dig their own. 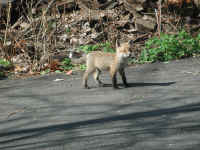 (Red Fox (Vulpes vulpes) - 11) This is another photo of this cute baby red fox. 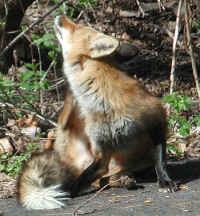 God gave the fox their soft fur coat. We have many other materials to keep us warm without taking the life of another living being. 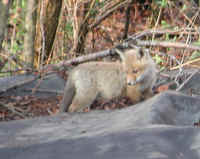 When the red fox pups are born they are nearly hairless, but very shortly they begin to develop their beautiful fur coats. (Red Fox (Vulpes vulpes) - 12) After watching the baby red foxes for even a short period of time, it becomes obvious that they think independently and have their own personalities. (Red Fox (Vulpes vulpes) - 13) Red fox parents are very devoted to their young. 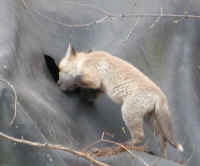 If a red fox has the opportunity to acquire more food than their immediate need, they will bury it near their home so that their family always has something to eat. This, however, can also lead to a problem of fly eggs and maggot being in the food, which can cause serious injury or death to the pups. 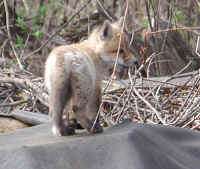 (Red Fox (Vulpes vulpes) - 14) Insects are among the first food that young foxes are taught to hunt, and we believe that it's insects that are holding this baby fox's attention. 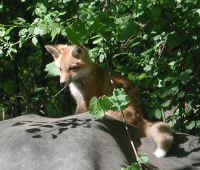 (Red Fox (Vulpes vulpes) - 15) This baby red fox continues his or her hunt for insects. (Red Fox (Vulpes vulpes) - 16) This little red fox is still intent on looking for insects. 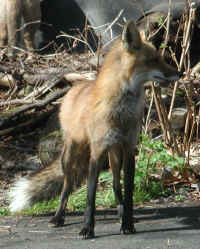 Also note the black fur on the back of his or her ears, which is another distinguishing feature of the red fox. (Red Fox (Vulpes vulpes) - 16a) Something inside his or her home keeps attracting the attention of this young red fox. (Red Fox (Vulpes vulpes) - 17) Now the young red fox near the entrance to their home comes down to join his or her sibling and investigate what's in the ground. 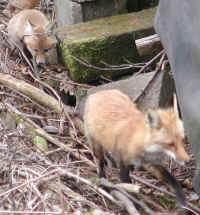 (Red Fox (Vulpes vulpes) - 18) Both of these baby red foxes are exploring what's under the sticks that cover the ground beside their home. (Red Fox (Vulpes vulpes) - 19) These cute little red foxes continue with their playful education of the world around them. 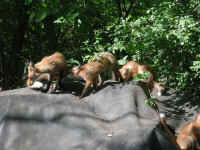 Our experience in watching them is no different than watching companion cats and dogs. 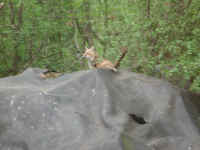 (Red Fox (Vulpes vulpes) - 20) This baby red fox is playing on top of his or her home. It is amazing how obedient these children are. 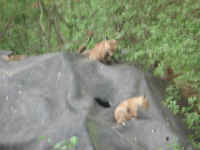 They are left alone for many hours, and we have not seen them go more than about 20 feet from their home unless Mom is with them. (Red Fox (Vulpes vulpes) - 21) If human beings would only allow themselves to get to know the non-companion animals around them in the same kind of personal way that they get to know their companion animals, we believe there would be a lot less violence in the world. There really is no difference; they all have the same kinds of souls and spirits, and desire the same love and affection. 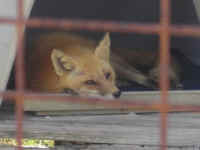 (Red Fox (Vulpes vulpes) - 22) We didn't tell our human neighbors about this family of red foxes, because we knew the cruelty and hardness of heart of some of them, and didn't want anyone to harm these precious babies or their mother. (Red Fox (Vulpes vulpes) - 23) When we watch these baby red foxes playing in our presence, it's like having a taste of the Peaceable Kingdom of which Isaiah wrote (Isaiah 11:6-9). In this kingdom, no one will hurt or destroy, for the earth will be full of the knowledge of the Lord as the waters cover the sea. Is the reason we don't have this peace is because most people lack the knowledge of the Lord, and the desire to acquire it? If we truly want this kind of total peace, we can have it! (Red Fox (Vulpes vulpes) - 24) While watching these cute red foxes play, it hard to think about them being on their own in another 5 months, and parents in another 10 months. 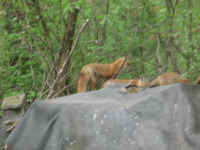 The mother red fox will stay with her pups until autumn (about 7 months). 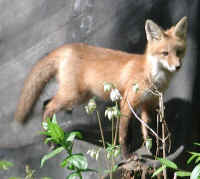 The red fox does not become sexually mature until they are about 10 months old, which would be the end of December, their normal breeding season. 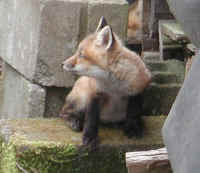 (Red Fox (Vulpes vulpes) - 25) This is another of the baby red foxes standing on the "door step" of their home. 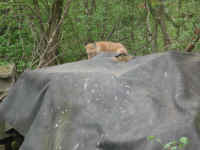 (Red Fox (Vulpes vulpes) - 26) The red fox pup on the "roof" of their home is still content to be resting. 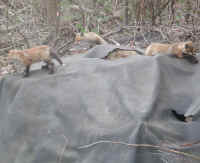 (Red Fox (Vulpes vulpes) - 27) This is the first photo we were able to take that showed all five baby red foxes, and even then we couldn't get their whole bodies in the photo. 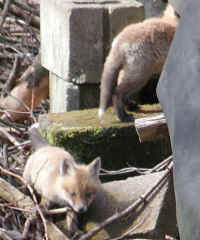 (Red Fox (Vulpes vulpes) - 28) And before we had a chance to take another photo of all five baby red foxes together, they had moved apart, leaving us only three to photograph. 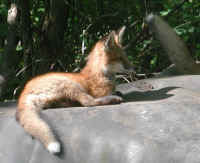 (Red Fox (Vulpes vulpes) - 29a) And then there was only one baby red fox on the roof. 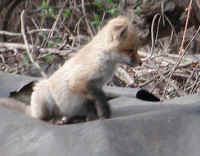 (Red Fox (Vulpes vulpes) - 30) However, within a few minutes, there were four red fox pups back lounging on the roof. (Red Fox (Vulpes vulpes) - 30a) The expressions and curiosity of these wild red fox pups are the same as we would see in any of our companion animals; thus, they deserve the same love and respect. 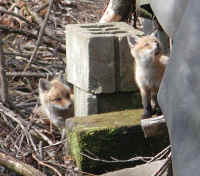 (Red Fox (Vulpes vulpes) - 31) This is another photo of the three red fox pups on the roof of their home. 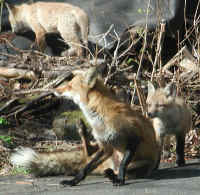 Notice that the fox on the right has crossed his or her legs, much in the same way as we do. (Red Fox (Vulpes vulpes) - 32) Watching these red fox youngsters was part of the joy of each day that they lived near us. 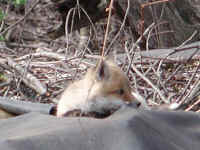 (Red Fox (Vulpes vulpes) - 32a) These red fox youngsters are in the tangle of wild grape vines that hang down over part of their home. 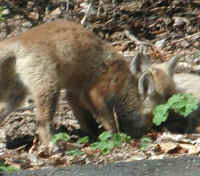 (Red Fox (Vulpes vulpes) - 33) Our driveway soon became an extension of the red fox youngster's playground. 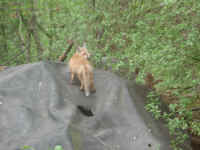 (Red Fox (Vulpes vulpes) - 34) This was the first photo we were able to take of Mama Red Fox. 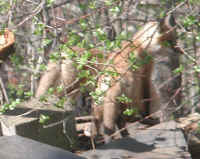 Usually, she would growl to scatter her children and then run off a short distance into the woods, and before we had a chance to take her picture. Even after we took this photo, she growled and ran off. 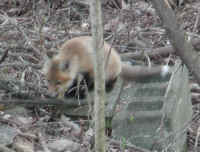 She was much more cautious than the gray fox mother who used to live here. 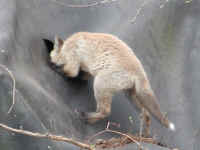 (Red Fox (Vulpes vulpes) - 35) This red fox is playing with a sibling on the other side of the hole in their home. 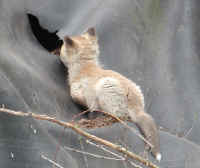 (Red Fox (Vulpes vulpes) - 36) The red fox pups continued to play on either side of the "window" of their home. (Red Fox (Vulpes vulpes) - 37) The red fox play at the window continued for a longer period than most of their other antics. (Red Fox (Vulpes vulpes) - 38) We never were able to get a clear view of the red fox youngster on the inside of their home, but it is obvious from watching the actions of the one on the outside that he or she did. (Red Fox (Vulpes vulpes) - 39) After about five minutes, the play slowed down, and the red fox on the outside sat down to wait for the next time to pounce at his or her sibling. 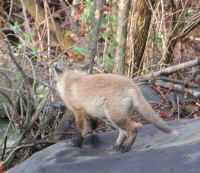 (Red Fox (Vulpes vulpes) - 40) After tiring of the last game, this red fox youngster is off in search of another. (Red Fox (Vulpes vulpes) - 41) This little red fox is learning about the world from his or her front porch. (Red Fox (Vulpes vulpes) - 42) And here, another sibling is studying the world around him or her. 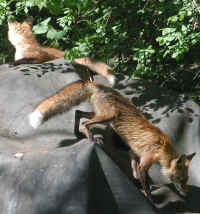 (Red Fox (Vulpes vulpes) - 43) Three of the young red foxes gathered on the roof of their home in the early morning to see what differences this day would bring. 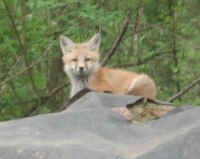 (Red Fox (Vulpes vulpes) - 44) This is one of the young red foxes on the roof of their home. 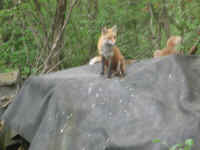 We never did figure out what fascinated them up there, because we didn't want to disturb them by taking a closer look. 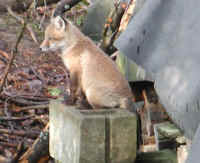 Our enjoyment was in watching the foxes. 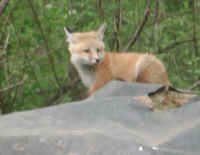 (Red Fox (Vulpes vulpes) - 44a) This little red fox is also enjoying the day on the roof of their home. 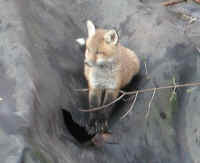 (Red Fox (Vulpes vulpes) - 45) This is another one of the five young red foxes who enjoys bring on top of their home. 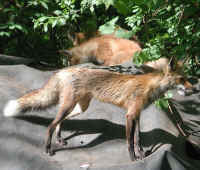 (Red Fox (Vulpes vulpes) - 46) The young red foxes are getting bigger by the day. 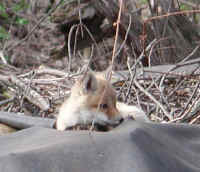 They're starting to venture out a little farther from their home, but their primary place of enjoyment still seems to be their roof. (Red Fox (Vulpes vulpes) - 47) The young red foxes never seem to sit still very long. When we took this photo, these two youngsters were resting quietly; then, in the time it took to click the shutter of the camera, they suddenly moved, cause their heads to blur. 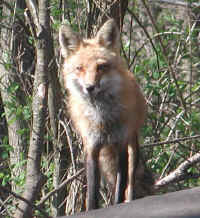 (Red Fox (Vulpes vulpes) - 48) We took this photo of the young red foxes from our porch deck, which is about 40 feet away from where they were playing. 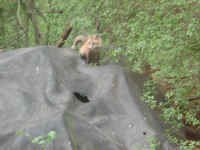 In the beginning, they were very cautious of our presence, but gradually became accustomed to our non-threatening presence. They still run from other people, thankfully. (Red Fox (Vulpes vulpes) - 48a) This is a closer look at one of the young red foxes. 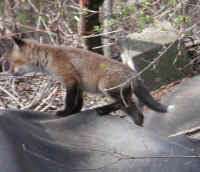 (Red Fox (Vulpes vulpes) - 49) More rooftop play for these young red foxes. 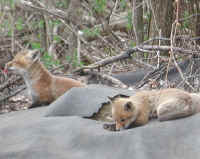 (Red Fox (Vulpes vulpes) - 50) Watching these young red foxes, you can almost hear them thinking, "Hmm! I wonder what's going on out there in the woods?". (Red Fox (Vulpes vulpes) - 51) When we take the time, day after day, to try to understand animals on their own terms, as with this red fox family, we gain a greater understanding of the whole of creation, and it's right to exist in peace. The world isn't perfect, and there still remains much pain and suffering, but we shouldn't be adding to it; we should be working to eliminate as much pain and suffering as we can. and bring peace to the world. (Red Fox (Vulpes vulpes) - 52) Of all the places the young red foxes like to play, the roof of their home seems to be their favorite. (Red Fox (Vulpes vulpes) - 53) The more we watched this young red fox family, the more we saw the similarity of their behavior with that of young companion dogs and cats. The only exception was their human interaction, and that is only because they've never been exposed to it. 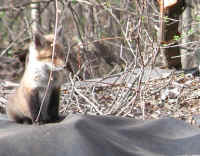 (Red Fox (Vulpes vulpes) - 53s) We're not the only ones who have foxes for neighbors, and in some of these situations, there is human interaction. On 27 November 2004 Kathleen Selman sent us an email about this series: "Fab photos! 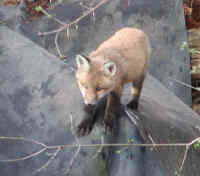 We once had the honor of having a pet fox for six months. Then she went of her own free will to the wild. 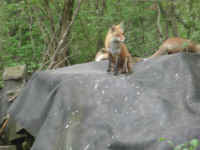 Wonderful foxes; and we have wonderful memories. All animals are so serene, peaceful, and beautiful. Regards, and God save the animals. We will try to do so to." Then on 7 Feb 2005 she sent us the photo: "The picture shows our little friend with one of my sons as they share their meal. Probably the most wonderful experience in our lives, especially for our children, to have met a wild creature as a friend." - This is just another example of God's Peaceable Kingdom, where neither human nor animal will do any harm to one another ever again (Isaiah 11:6-9); and it fills us with hope. 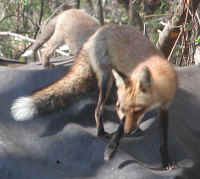 (Red Fox (Vulpes vulpes) - 54) This is another photo of two of the young red foxes playing and exploring things on the roof of their home. (Red Fox (Vulpes vulpes) - 55) Most of the time, these young foxes are well aware of our presence, but because they didn't feel threatened, they went about doing their own things. We can have a peaceful co-existence with the whole of creation, if we want to. (Red Fox (Vulpes vulpes) - 56) This young red fox also seems to enjoy sitting on their porch. 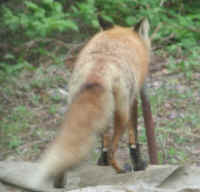 (Red Fox (Vulpes vulpes) - 57) Behind this young red fox, we can see the fluffy tip of Mama Fox's tail. She has become a little more used to our non-threatening presence. (Red Fox (Vulpes vulpes) - 58) These two young red foxes are watching something toward the rear of their home. (Red Fox (Vulpes vulpes) - 59) More and more, Mama Red Fox became cautiously comfortable with our presence. 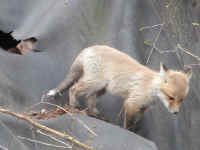 Here her curiosity overcame her fears and she stood on top of her home watching us take her picture. 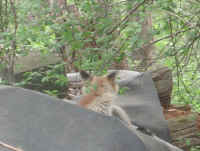 (Red Fox (Vulpes vulpes) - 59a) This is a closer look at Mama Red Fox looking at us. There is something truly special when we have a chance to connect with a wild animal. (Red Fox (Vulpes vulpes) - 60) Even though we didn't see Mama Red Fox very often, when we did see her, she began to go about her normal routine with her children in our presence. We never fed them or did anything else to encourage a closer relationship; all we did is act as loving peacemakers toward the whole of creation, and she responded. If anyone else approached, she and her children would hide. Notice that she even has her eyes closed, and that one of her children has a big yawn. 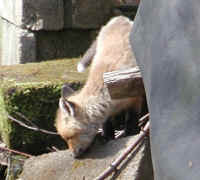 (Red Fox (Vulpes vulpes) - 61) Mama then decided it was time to get off her roof, and resume her duties. 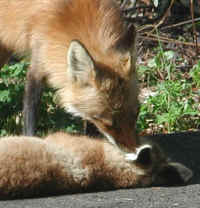 Red fox are very devoted parents. (Red Fox (Vulpes vulpes) - 62) We never saw Mama and Daddy together, and since the coloration of male and female red fox are the same, it is often hard to tell which parent we're looking at. On this day, Daddy was with the kids. 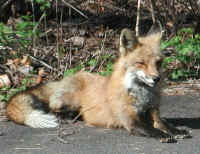 He also seems to feel comfortable enough in our presence to sit down on the driveway for a soothing scratch. Look at the expression on the young one's face, as he or she watches. 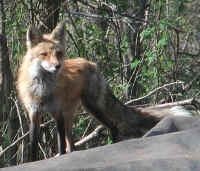 (Red Fox (Vulpes vulpes) - 63) In this photo, we have a good look at many of the characteristics of an adult red fox. They have the general physical appearance of lean long-legged dog. 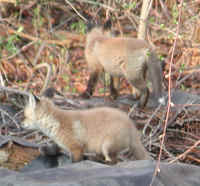 Both the children and the the adults have the red body fur, black legs, white fur around the mouth, and on the tip of the tail, but the adult's tail is much more bushy. 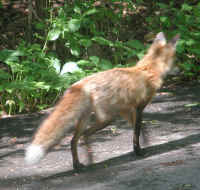 (Red Fox (Vulpes vulpes) - 64) The early morning sun casts a long shadow of the red fox on the driveway. 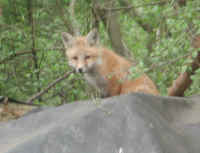 There is something truly awe inspiring about being able witness wildlife this close on their own terms, and not ours. (Red Fox (Vulpes vulpes) - 64a) This is a closer look at the red fox. (Red Fox (Vulpes vulpes) - 64b) The more we watched the red fox, the more we could relate to God having created all of the animals to be our companions, and not as something to be exploited. 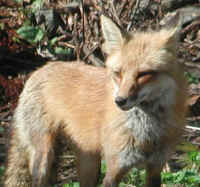 There really should be no difference between our relationship with this red fox and any of our companion dogs or cats. 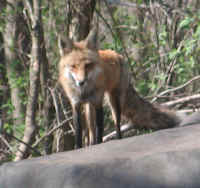 (Red Fox (Vulpes vulpes) - 65) This is another look at the red fox. 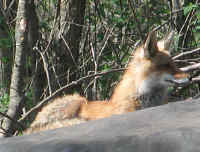 (Red Fox (Vulpes vulpes) - 65a) In this red fox photo, we can see the black fur on the back of the ears, which is another identifying characteristic of the red fox. 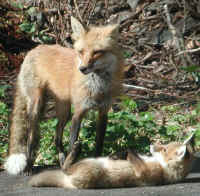 (Red Fox (Vulpes vulpes) - 66) This is Mama Red Fox just getting up from relaxing on the warm driveway to tend to the kids. She still seems to be half asleep. 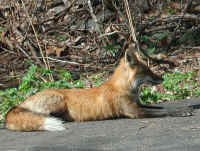 (Red Fox (Vulpes vulpes) - 67) A few minutes later, Mama returns to lounging on the warm driveway. 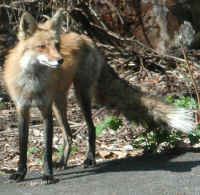 It's impossible to see a red fox like this and not see the similarity to a family dog. 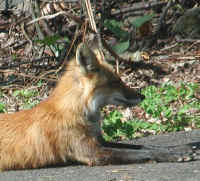 (Red Fox (Vulpes vulpes) - 67a) This is a closer look at Mama lounging on the driveway. (Red Fox (Vulpes vulpes) - 68) Like all mothers with young children, this one doesn't have a lot of time to relax, either, and soon one of her kids comes over for some attention, and she is back on her feet. 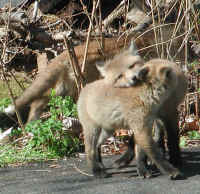 (Red Fox (Vulpes vulpes) - 68a) The gentle touch of a loving mother is a universal characteristic. 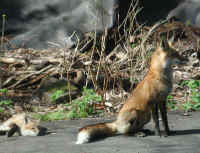 It makes no difference whether the mother is human or a red fox. 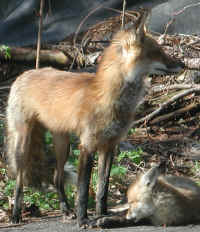 Also notice the fuzzy texture of the child's fur as compared to the mother's long straight fur. (Red Fox (Vulpes vulpes) - 69) As soon as the mother red fox straighter up, her young one rolls over on to his or her back and looks up for more attention. 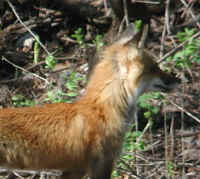 (Red Fox (Vulpes vulpes) - 69a) This is a closer look at the mother red fox. (Red Fox (Vulpes vulpes) - 69b) We love the expressing on this little one's face as he or she looks up at Mama. 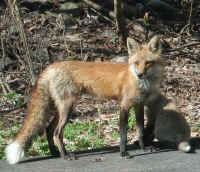 (Red Fox (Vulpes vulpes) - 69c) This young red fox was watching from the woods as Mama tended to his or her sibling on the driveway. (Red Fox (Vulpes vulpes) - 70) It has been a real blessing to be able watch this red fox family living free as God intended, and to be able to get a photo like this one of Mama. 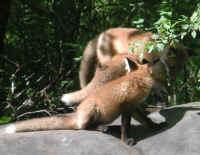 (Red Fox (Vulpes vulpes) - 71) This is another photo of Mama Red Fox with one of her five children. (Red Fox (Vulpes vulpes) - 72) In all the time we watched this family of red foxes, we never saw the children having to be disciplined. They always seemed to follow the parents' instructions. (Red Fox (Vulpes vulpes) - 72a) This is a closer look at Mamma Red Fox and one of her children. 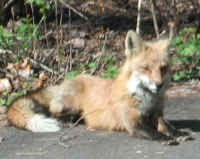 (Red Fox (Vulpes vulpes) - 73) When Mama Red Fox is around, we most often find her lounging on the driveway. 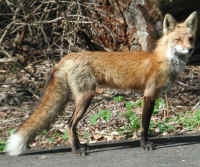 (Red Fox (Vulpes vulpes) - 73a) In this photo of Mama sitting on the driveway, we have an excellent view of the characteristic bushy red fox tail with its white tip. (Red Fox (Vulpes vulpes) - 74) To look at us, Mama Red Fox has to squint her eyes in the bright sunlight. (Red Fox (Vulpes vulpes) - 74a) When we looked upon the face of this red fox, we find it so hard to understand how anyone would want to harm them, and much less that they would take pleasure in doing so. 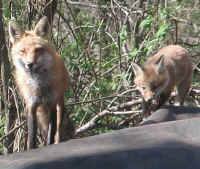 Nevertheless, because most people seem to be afraid of them, and seek to do them harm, we never attempted to establish a personal relationship with this red fox family; we limited our involvement to these close encounters. 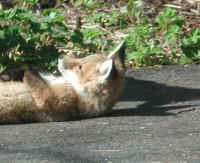 (Red Fox (Vulpes vulpes) - 75) Mama Red Fox is getting ready to lie down on the driveway. (Red Fox (Vulpes vulpes) - 76) Rest times for Mama Red Fox are very short and soon she's back on her feet looking at the road and toward the noises she hears. (Red Fox (Vulpes vulpes) - 77) Notice the alert look on this red fox's face as she listens to some noises. She wants to make sure that she and her family are not in danger. 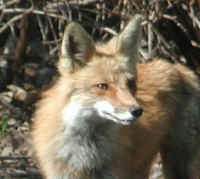 (Red Fox (Vulpes vulpes) - 77a) This is a closer look at the alert look on this red fox's face. 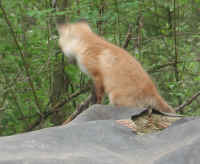 (Red Fox (Vulpes vulpes) - 78) This is Mama Red Fox standing on the roof of her home. (Red Fox (Vulpes vulpes) - 79) Most of our photos of the adult red fox were taken in the mornings when the bright sunlight was still casting long shadows. 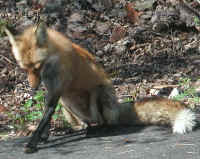 (Red Fox (Vulpes vulpes) - 80) We can almost feel the contentment of this red fox mother, as she gets a break from the kids, and can sit down on the driveway for a soothing scratch. 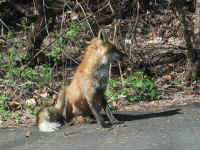 (Red Fox (Vulpes vulpes) - 81) After her scratch, this red fox mother sits down on the driveway and looks around. 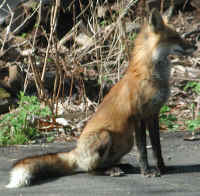 (Red Fox (Vulpes vulpes) - 81a) This is a closer look at the red fox sitting on the driveway. 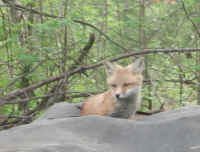 When we humans make the knowing choice to live in the domain of wild animals, we also need to learn how to coexist. They are not "vermin"; they are our neighbors, and the Bible teaches us that we are to love our neighbors as ourselves (Leviticus 19:18). 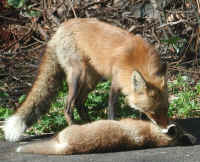 (Red Fox (Vulpes vulpes) - 82) After satisfying herself that all is well, this red fox mother lies down on the driveway. (Red Fox (Vulpes vulpes) - 83) We love having the kind of relationship with the whole of God's creation, where even a wild red fox will feel comfortable enough to lounge on the driveway. 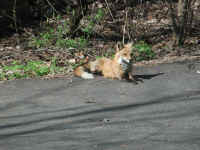 (Red Fox (Vulpes vulpes) - 83a) This is a closer look at our red fox neighbor, as she continues to lounge on the driveway. (Red Fox (Vulpes vulpes) - 84) This young red fox stands on the driveway looking at his or her mother as she goes off into the woods. (Red Fox (Vulpes vulpes) - 84a) This is a closer look at this young red fox. We don't understand how anyone could look into the face of such a precious living soul, and still want to do him or her harm. (Red Fox (Vulpes vulpes) - 85) Two of the red fox youngsters give each other a loving hug, and a third sibling explores something in the woods behind. 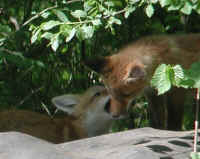 (Red Fox (Vulpes vulpes) - 86) These are two of the young red foxes enjoying each others company. 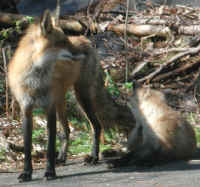 (Red Fox (Vulpes vulpes) - 87) These two red foxes continue to play on the edge of the driveway. 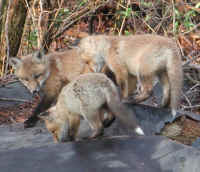 (Red Fox (Vulpes vulpes) - 88) These three young foxes found something of interest in the woods beside the driveway. 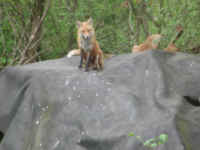 We believe that by keeping the woods as natural as possible, we attract more wildlife. 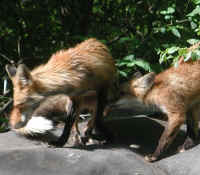 (Red Fox (Vulpes vulpes) - 88a) In this photo, we have a closer look at the two young foxes with their heads together inspecting something on the ground. 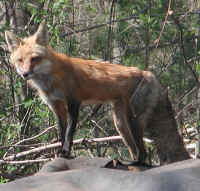 (Red Fox (Vulpes vulpes) - 89) Mama Red Fox surveys her surroundings from the roof of her home. 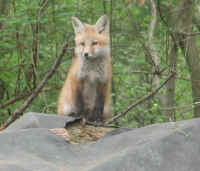 (Red Fox (Vulpes vulpes) - 90) This is another photo of the mother red fox on the roof of her home. 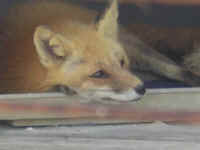 (Red Fox (Vulpes vulpes) - 91) After looking around to make sure everything was safe, Mama Red Fox lies down on the roof of her home. (Red Fox (Vulpes vulpes) - 92) While the mother red fox watches from the roof of their home, her children continue to play on the ground. (Red Fox (Vulpes vulpes) - 92a) This is a closer look at two of the red fox youngsters playing. 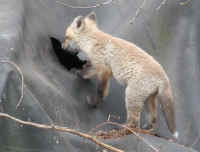 (Red Fox (Vulpes vulpes) - 92b) This is a closer look at two of the other red fox youngsters playing. (Red Fox (Vulpes vulpes) - 93) With the sense of well being that her children are safe, Mama Red Fox begins to close her eyes as she lounges in the warming morning sun. 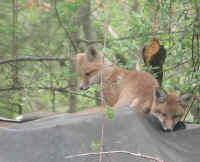 (Red Fox (Vulpes vulpes) - 94) Two of the young red foxes relax for a few moments on the roof of their home. 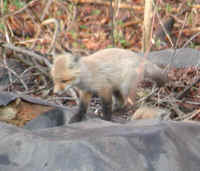 (Red Fox (Vulpes vulpes) - 95) One of the red fox youngsters investigates something in the woods near his or her home. 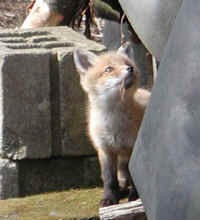 (Red Fox (Vulpes vulpes) - 96) This is a young red fox standing at the roof entrance to their home. 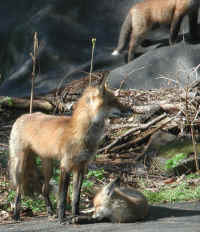 (Red Fox (Vulpes vulpes) - 97) These three young red foxes are looking at something in the woods behind their home. 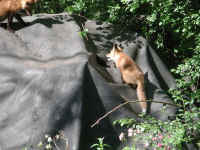 (Red Fox (Vulpes vulpes) - 98) Now it's time for a red fox inspection of something on the roof of their home. (Red Fox (Vulpes vulpes) - 99) The roof of their home seem to be a very popular place for the red fox. 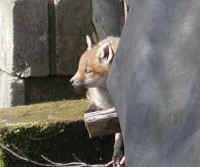 (Red Fox (Vulpes vulpes) - 99a) This young red fox is looking through the roof top entrance at something going in in their home. 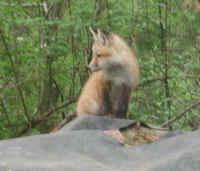 (Red Fox (Vulpes vulpes) - 100) This young red fox finally lies down on the roof of their home, but continues to look around at what going on in the surrounding woods. (Red Fox (Vulpes vulpes) - 100a) There always seems to be something new for the young red fox to look at. (Red Fox (Vulpes vulpes) - 101) From the look on this young red fox's face, it's as though he or she is saying, "excuse me while I scratch." (Red Fox (Vulpes vulpes) - 102) As this young red fox finishes scratching, his or her attention is quickly turned to something else. (Red Fox (Vulpes vulpes) - 103) Mama Red Fox and some of her children on the roof of their home. 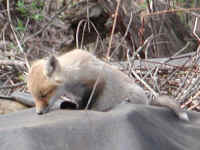 (Red Fox (Vulpes vulpes) - 103a) This young red fox seems to be still trying to nurse. 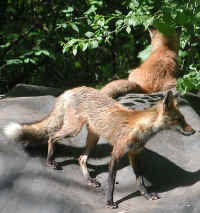 Some people have remarked that the color of these red foxes is "different". 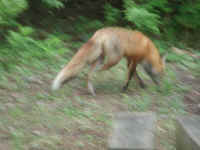 This is probably due to the photos that they have seen of the brighter red coloration of the English red fox. 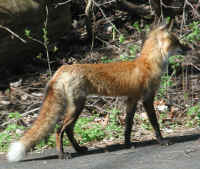 The American red fox coloration can vary from a pale yellowish red to a deep reddish brown, and this is why its important to spot the other distinctive color marking, which don't vary, such as the white tipped tail and the black feet. (Red Fox (Vulpes vulpes) - 104) This young red fox is touching noses with Mama, but more likely he or she is smelling Mama's breath and seeking something to eat. (Red Fox (Vulpes vulpes) - 104a) This young red fox is sitting on the roof of their home in the partial shade of the over hanging tree branches and the dangling grape vines. (Red Fox (Vulpes vulpes) - 105) Mama Red Fox and one of her children on the roof of their home. (Red Fox (Vulpes vulpes) - 106) When Mama Red Fox is home, she is very attentive to road noises, unlike her baby in the background, but she won't sound the alarm unless a stranger enters our driveway; however, she totally dismisses noises coming from across the lake. She wisely knows that if there is danger, it will be coming from the road. 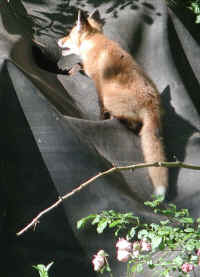 (Red Fox (Vulpes vulpes) - 107) Sensing no danger, Mama Red Fox decides to come down off the roof of her home. 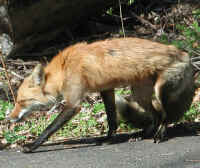 (Red Fox (Vulpes vulpes) - 108) Mama then decides to go and look for some food for herself and her young ones. 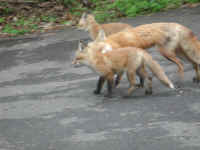 (Red Fox (Vulpes vulpes) - 109) As Mama Red Fox goes up the driveway, she calls to her children to follow. 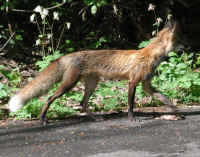 It is interesting to note in the stop action photo, that the fox walks with opposite legs (the left fore leg and right hind leg are moving together). When they run the legs move together. Notice also that your companion cats and dogs also walk and run the same way. (Red Fox (Vulpes vulpes) - 110) However, this young red fox decides not to go with Mama and two of her siblings. She just stands on the driveway watching them leave. 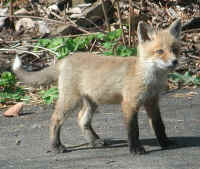 (Red Fox (Vulpes vulpes) - 111) And this young red fox doesn't even follow as far as the driveway. Those are short spur columbines blooming in the foreground. 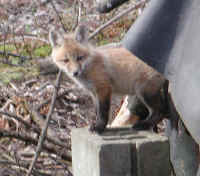 (Red Fox (Vulpes vulpes) - 112) And this youngster never leaves the roof of their home. 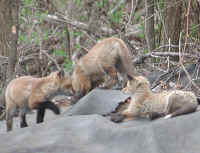 Their reactions to their mother's call to follow her on her search for food, also seem to indicate their degree of maturity: two followed and three remained behind. (Red Fox (Vulpes vulpes) - 113) Two of the red fox youngsters are playing a game on the roof of their home. (Red Fox (Vulpes vulpes) - 113a) Notice that the fur on the back of this red fox youngster is beginning to lose it fuzzy appearance and take on the straighter hairs of an adult. (Red Fox (Vulpes vulpes) - 114) Two of the red fox youngsters greet Mama upon her return. (Red Fox (Vulpes vulpes) - 115) This young red fox decided it was time to take a rest, unlike the departing sibling (note tail in upper right) who is off to seek something of interest. (Red Fox (Vulpes vulpes) - 115a) This young red fox is almost hidden under the tree branches and grape vines that overhang their home. 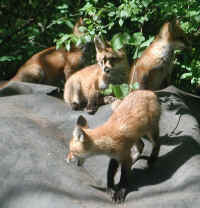 (Red Fox (Vulpes vulpes) - 116) Four of the red fox youngsters have gathered on the roof of their home. Notice how more and more of their fur is beginning to look like an adult's. (Red Fox (Vulpes vulpes) - 117) This red fox youngster is still stretched out, but remains alert to everything that's going on. (Red Fox (Vulpes vulpes) - 118) Two more of the red fox youngsters decide it's time to lie down and relax, but a fourth one has yet to make up his or her mind. 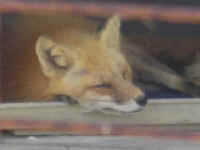 (Red Fox (Vulpes vulpes) - 118a) These two red fox youngsters have fallen asleep on the roof of their home. 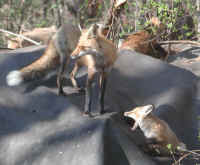 (Red Fox (Vulpes vulpes) - 119) Now, all five red fox youngsters have decided to lie down on the roof of their home (the fifth is almost hidden in the shadows to the right of the two on the right). (Red Fox (Vulpes vulpes) - 119a) In this photo, we have a closer look at the four red fox youngsters on the right of the previous photo. Note the one to the rear right. (Red Fox (Vulpes vulpes) - 120) But after only a few minutes of rest, one of the red fox youngsters is attracted to some movement and begins to crawl forward. 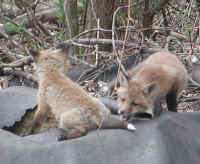 (Red Fox (Vulpes vulpes) - 121) Soon, three of the five red fox youngsters are up and moving again. (Red Fox (Vulpes vulpes) - 122) We find it interesting that the three red fox youngsters on the left seem to be alert, but they're looking in different directions, while the fourth, on the right, continues to sleep. (Red Fox (Vulpes vulpes) - 123) Then, these three red fox siblings begin to settle down again. 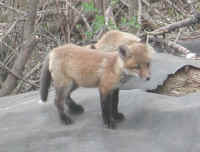 (Red Fox (Vulpes vulpes) - 124) In another couple of months, these red fox youngsters will be off on their own. 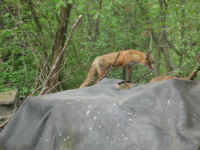 The following four red fox photos were take by Kristin Kirsch. She says. "In my opinion this is one of the cutest creatures in all of God's creation. This is Rocky. 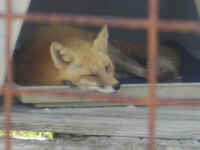 He lives in the OCTAGON WILDLIFE SANCTUARY AND REHABILITATION CENTER in Florida."